It was another great year at Old Settlers Music Festival in Driftwood, Texas! This was my third year to volunteer at the festival. I work with a great crew! We had a lot of fun! I only camped out for one night, but I got to see some great musicians, hears some tunes, and eat some wonderful food! OSMF is located at the Salt Lick Pavilion and camping at Camp Ben McCulloch. I didn’t take as many photos as I would have liked, but I took a few of Joe Ely on Friday night and Patty Griffin and Buddy Miller on Saturday night. However, I did eat one of the most delicious foods that I have ever tried, Pistoles. A pulled pork muffin drizzled with Salt Lick’s signature Chipotle BBQ Sauce, it was so good that I ate it every day! 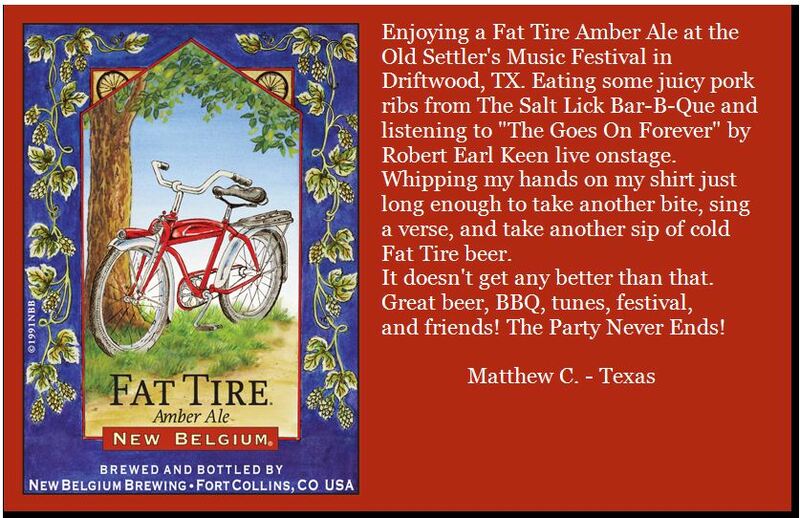 Enjoying a Fat Tire Amber Ale at the Old Settler’s Music Festival in Driftwood, TX. Eating some juicy pork ribs from The Salt Lick Bar-B-Que and listening to “The Goes On Forever” by Robert Earl Keen live onstage. Whipping my hands on my shirt just long enough to take another bite, sing a verse, and take another sip of cold Fat Tire beer. Great beer, BBQ, tunes, festival, and friends! The Party Never Ends! Being Spring time in Texas the weekend was very busy! There was a lot that I was unable to partake in, including a 40th reunion for my fraternity, Delta Tau Delta, Zeta Delta Chapter at Texas State. I’m sure that a great time was had by all, and I must see my fraternity brothers next year. This entry was posted in Good Times and tagged camp ben mcculloch, old settlers music festival, osmf, salt lick. Bookmark the permalink.